Two loving Christmas doves adorn this lovely sterling silver collectible ornament by Reed & Barton which can be personalized with the couple's names or initials to create a unique remembrance of their first Christmas together. This 2003 Our First Christmas Together in sterling silver is sure to become a favorite holiday keepsake and a special addition to annual Christmas Yuletide celebrations. Established in 1824, Reed & Barton has earned a worldwide reputation for creating fine-quality sterling silver flatware and giftware. Reed & Barton's finely crafted Christmas ornaments are cherished and collected the world over. 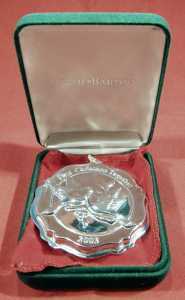 The highest standards of design and craftsmanship and hallmarks of all products manufactured by Reed & Barton - the foremost silversmiths for over 179 years! 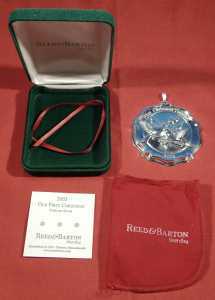 This Reed & Barton sterling silver ornament has never been used, is in excellent condition, and comes with the original tarnish-proof blue cloth Reed & Barton bag, a red satin ribbon and the original product card all enclosed in a hard, green velvet presentation box - perfect for holiday gift-giving! The flat back of this Christmas ornament could easily be personalized or engraved by your local shop. 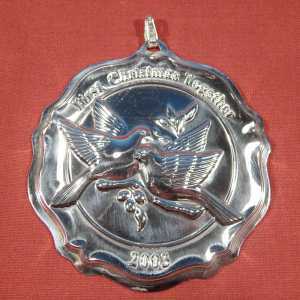 The collectible sterling silver FIRST CHRISTMAS TOGETHER ornament measures 3" x 3" and is engraved on the front with "FIRST CHRISTMAS TOGETHER 2003" and marked on the flat back with "REED & BARTON STERLING, within a holly motif logo.